It’s nearly impossible to find free sewing patterns on the ‘Net, so here are the patterns and how-to instructions for two styles of unisex casual pants I made yesterday. Now you can make your own. These are one-size fits-all pants that wrap around and tie with a sash. Very comfy and stylish, too. You can use almost any weight fabric—from silk to lightweight denim. The Thai ones are cotton or rayon. Make sure your fabric looks nice on both sides; I did mine with a contrasting top panel because the print I used for the legs looked ugly on the reverse. I measured and cut directly on the fabric without a paper pattern. Don’t forget to add extra for the seams. I usually do 1 cm all around. If you’re using fabric with a directional pattern, cut the cloth in half widthwise and turn the fabric so that the pattern runs the same direction on both legs. Sew the short ends of the top panel to form a large hoop. Hem one edge of the hoop. Sew the center front seam. 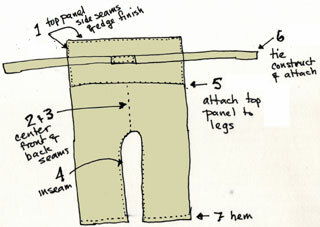 Sew the center back seam. Starting at the center and working out, sew the inseam. Attach the top panel to the legs. Construct the sash and attach to the top panel at the back. French seam the top panel sides so there are no raw edges. Finish the top panel edge with a tiny hem. Attached the belt securely to the center back of the top panel. To wear them, slip them on and hold the edges out from you (like a diet “after” picture). Pull one side tight against your body and bring the rest of the fabric across yourself to form an S curve. Bring the ties around your waist and knot. Fold the top down over the ties. These baggy pajama pants are derived from the mompe slacks in John Marshall’s “Make your Own Japanese Clothes.” An elastic waist makes them really easy to wear. You can increase the width of the leg opening to get a more skirt-like palazzo pant. This pattern needs to be drafted onto paper, but it’s not difficult to do at all. Once you’ve done it, you can use it over and over, or until you size changes. Now lay out your newspaper so that it matches the waist to floor measurement. Tape together if necessary. From one corner of the paper, measure 1/3 your hip measurement and mark it. Move over 1/12 of your hip measurement and mark that. At the 1/3 + 1/12 point, draw a line all the way down the paper. Calculate the inseam: crotch to floor minus 5 cm. 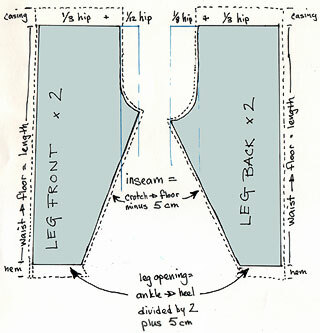 Using a tape measure stretch to the inseam length, make a diagonal from the end of the leg opening to the 1/3 + 1/12 line. 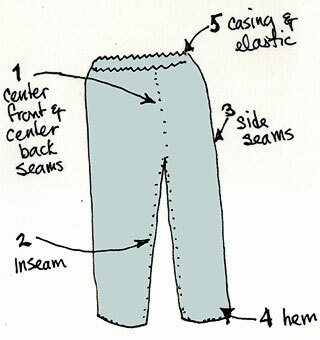 Draw a gentle J-shaped curve from the end of the inseam to the 1/3 mark. Same as the front leg, but use 1/3 plus 1/8 of your hip measurement. This allows a little extra room for your derriere. 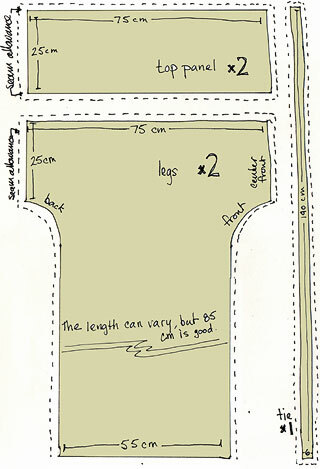 Follow the pattern, adding seam allowance all around, plus about 8 cm at the top for the elastic casing and 5 cm (or more) at the bottom for a hem. Sew the center front seam and center back seam. Starting at the center and working down the leg, sew the inseam. Construct the casing and thread the elastic through. Now isnt this exactly what GG was looking for? Way cool! Thanks Kristen! I am desperate for some new and funky casual duds. If I grab some fabric, can I come over for a sewing session? I will also bring something yummy to eat!! We call it Kaang-Keng-Lay, Kaang-Keng means pants and Lay (Talay) means sea (where the fisherman works). But not only for the fisherman, people across the country from the North to the South wear Kaang-Keng-Lay. You can find it at $2 in Thailand. Cheap? YAY! I went to Vietnam about months ago and all of the foreigners had these pants. I was dying for a pair because they look ultra comfy and easy, but I never found any and couldn’t figure out how to make them. Thanks! Thank you for providing the pattern, I saw someone wearing them and have been looking for a pattern ever since (about a year). I am going to make several pairs which I am sure will replace my comfy jeans as my favorite thing to wear! I don’t understand why you need to do the extra step of adding a top panel. Why can’t you just extend the top portion of the legs for however many inches/metres that the top panel is? Isn’t that the same thing? Am I missing something? Thanks for posting free pattern instructions. That was very nice of you. My Goddaughter, Sari, brought these great pants to me from her travels in Thailand. The rayons are my favorite because the fabric is so soft and they dry so quickly. 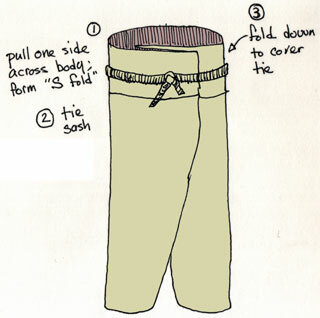 However, all my fisherman pants have a third panel sewn in the leg seams. She paid around $2 for the pants and her friends are selling them here in the States for $15-20. This helps pay their airfare and travel expenses when visiting Thailand. Thank You so much for the Thai fishermans pants pattern. I teach sewing to High School students and they range in ability. I am sure that these Thai fisherman pants will be quick easy and a great start to many sewing projects to come. Thank you! How generous of you to share your information. This is terrific. I am one who hates sewing, but loves comfy clothes. I have been waiting for pants like these! Ohh, think of the colors and patterns to try. Even I can sew them! Thank you so much for this pattern - this is awesome. I will be buying loads of fabric so I can get started on these. Just wondering, since I’ve never seen Thai fishermen’s pants (well, i have, but I’m not entirely sure that what i know is what everyone else is thinking of..), what these pants end up looking like…could you post pictures? thanks for posting the pattern. really cool. …I have been looking for this pattern and am as pleased as can be to have found your concise, easy to understand directions! Great job!!! Thanks so much!